Hi all, Sunny Meadows here. Everyone knows that summer is my favorite season of the year. But I have to say Thanksgiving is my favorite time of year. It's right after scary Halloween and right before the craziness of Christmas and Hanukkah and often gets overlooked. I just love how family and friends gather together over a great meal and really reflect on all they are thankful for. My best friend Jo is a fabulous cook. Detective Stone and I will be eating turkey at her new house with her fiance Cole, her bartender Sean and her cousin Zoe. Granny Gert will bring dessert of course, and I will provide the coffee, tea, and cocoa. They won't allow me to bring any food, though I can't say I blame them. As much as I squabble with my parents, I do know they love me so yes, they will be there as well. Given all the tragedy that has gone on in the world lately, I am very thankful to be alive. I am thankful to have a family. I am thankful to have a good man who loves me. I am thankful for my friends. I am thankful that my town is at peace for the moment with no current murders. And I am thankful for my sidekick soulmate cat named Morty. So tell me during this special time of year. What are you all thankful for? 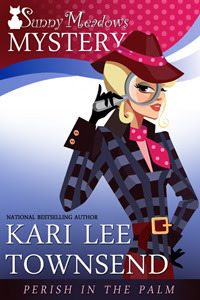 To find out more about me and all of my books, check out karileetownsend.com and stay tuned next month for a whole month of giveaways on Killer Characters during our Season's Readings event. Good luck to you all! I'm thankful for all of my family. My Mom wanted a family reunion this summer with all of her kids and grandkids and great grandkids. There were 84 of us that were able to make it there. There were some missing that couldn't make it. And there have been more babies born since, including a great great grandchild. We have a great family!